A broadly rounded shrub with rounded seven inch flower heads. The blooms are blue in acid soil and pink in alkaline soil. This is a choice rebloomer, forming flowers on both old and new wood. New flowers are encouraged by the removal of spent flower heads. 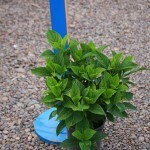 It needs moist soil and prefers part shade.